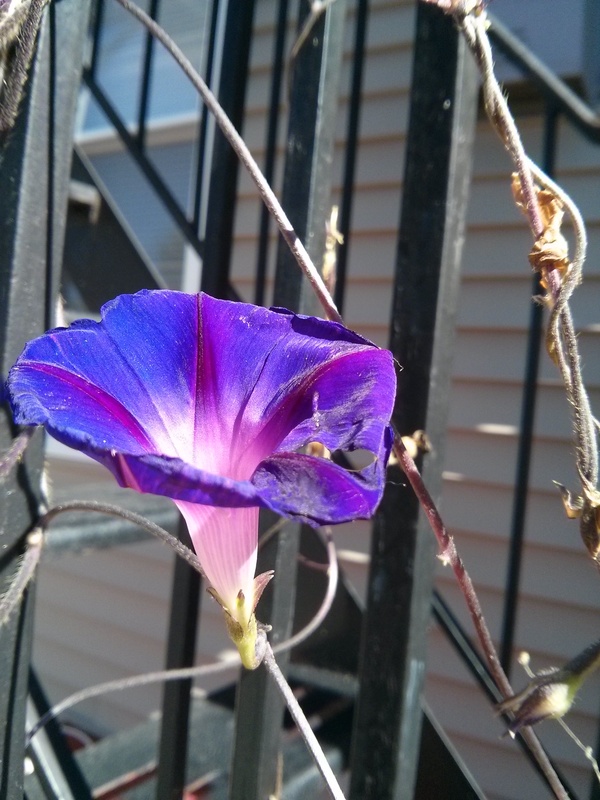 Morning glories are made for climbing, and the ones I started back in June haven’t disappointed. They started off small, but given a little room to grow and something to hold onto, they pulled themselves up (would you expect anything different?) and are still doing what they always do, sharing their beauty. I also planted some in the garden, but these ones were destined for the back of the house. They had a summer romance with the fire escape, and now in fall, they’re still showing their color. It was Saturday, I was giving two friends a little moving help, and I took some pictures. “Oh! A photo shoot!” my friend said enthusiastically, in her way. I think she was right. Flowers, seed pods, and former flowers turning into seed pods – it’s all there, something for everyone and something also to help a few friends remember a long day before the start of a long ride. Is that seed pod smiling? Maybe it’s mirroring the morning glory nearby. 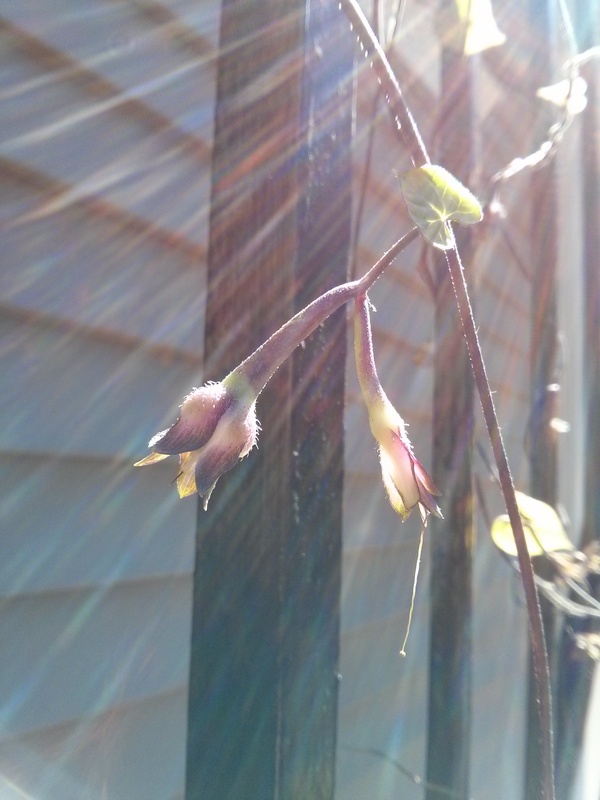 This entry was posted in Uncategorized and tagged beauty, fire escape, flowers, friends, life, morning glories on September 30, 2014 by dave379. It took me three months, but I’ve done it! I’ve determined the cost of breakfast. 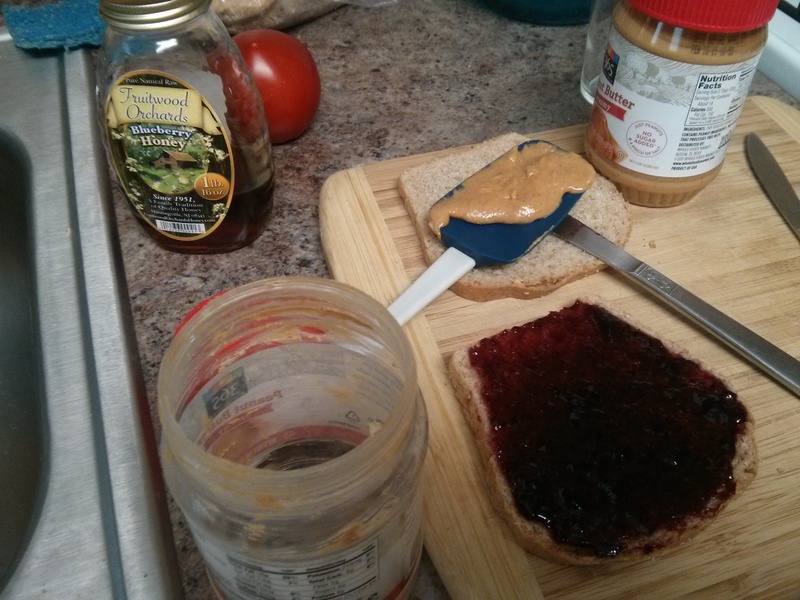 I don’t remember when exactly it became my breakfast – two pieces of toast, one with jam and the other with peanut butter and honey – but I know it was at least three and a half years ago. 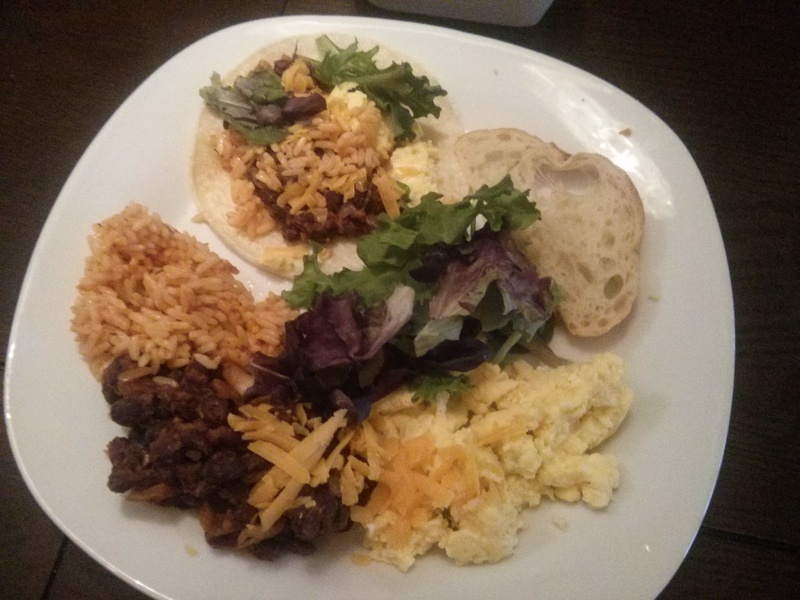 This is how breakfast looked in May 2014. It would have looked pretty similar in May 2011. Him/her: But they’re practically the same thing. Me: Nah, they’re not the same. They might get mixed around once they’re inside, but they start off separate. On the first day then, May 20, 2014, the cost of breakfast was $15.07. That’s a lot, but the plan of course wasn’t to determine the cost of breakfast in a single day. There was still food left to eat and average out. I was going to keep going, two pieces of toast at a time (breakfast everyday), until I’d used everything up. Whenever one ingredient would get finished, I’d buy another one, like for like. Only when I’d finished the last of the original ingredients (if you guessed it was the honey, you’re right!) would I be done. This includes not only pictures and words (always helpful), but also numbers and words (spreadsheet!) 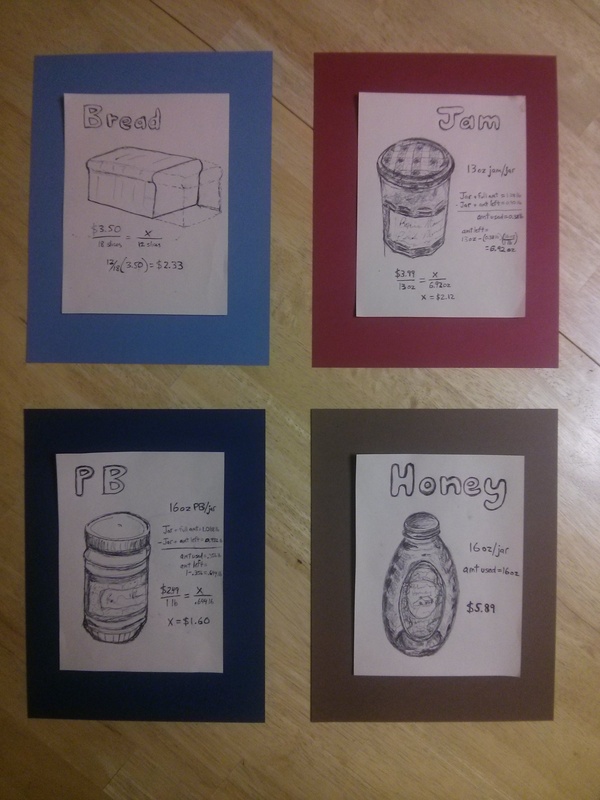 and pictures and numbers (art!). You might say the last two are complementary, supplementary, and…. alimentary. First replacement today! New bread. Okay, so there were a few days when I didn’t eat my regular breakfast. Sometimes, you know, you’re out visiting friends, on vacation, or doing a bike ride or something else. All such variations are noted and accounted for on the spreadsheet, however. On July 4, for the record too, I did eat my regular breakfast later on that day to keep pace. The changing of the peanut butter. Here also – the spatula again, and a tomato photo bomb. 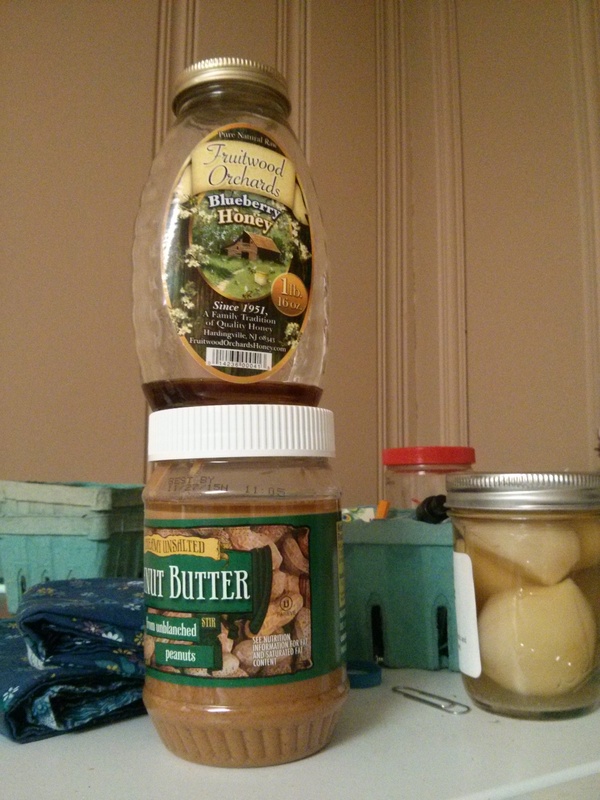 When I took this picture of the honey and peanut butter, at first I was like, Finally, I’m almost done! And then I was like, Wait, but then I’ll be done! It reminded me of a time in middle school when I was reading a book that I liked so much that I didn’t want it to end. I tried to remember what book it was – I was recalling kids, a secret garden, and an element of mystery and magic, and possibly it being a Battle of the Books book (EB reference) – but in this case my insufficient memory trumped my internet skills. Any thoughts? It wasn’t The Secret Garden, as I learned later after taking that one out of the library and reading it for the first time, but as a bonus, at least now I know another kids book that I like. I said goodbye to the last of the original 16 oz of honey on this day, and with my limiting reagent now gone, it was time for step two: mathematics. 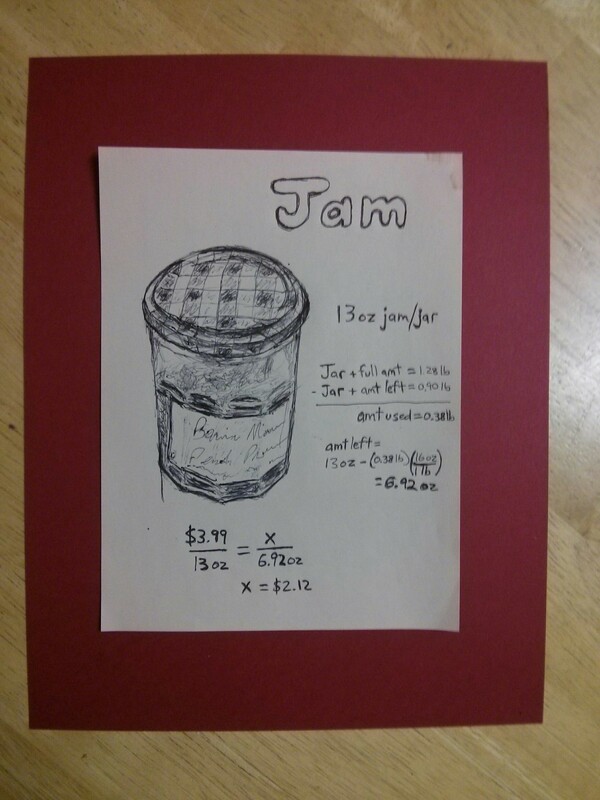 The interesting thing is, math can be creative too. This is not to say I made up the numbers, but rather that I enjoyed creating the requisite spreadsheet. What’s not to like about figuring out formulas and making accurate and interesting notes??? I’ve got columns for weekday, date, bread, jam, peanut butter, day, effective day, the cost of breakfast, food notes, and extra notes. Before I could finish the spreadsheet and determine the cost of breakfast, I realized there was one more thing to do: determine and subtract out the value of the food amounts remaining at the end. 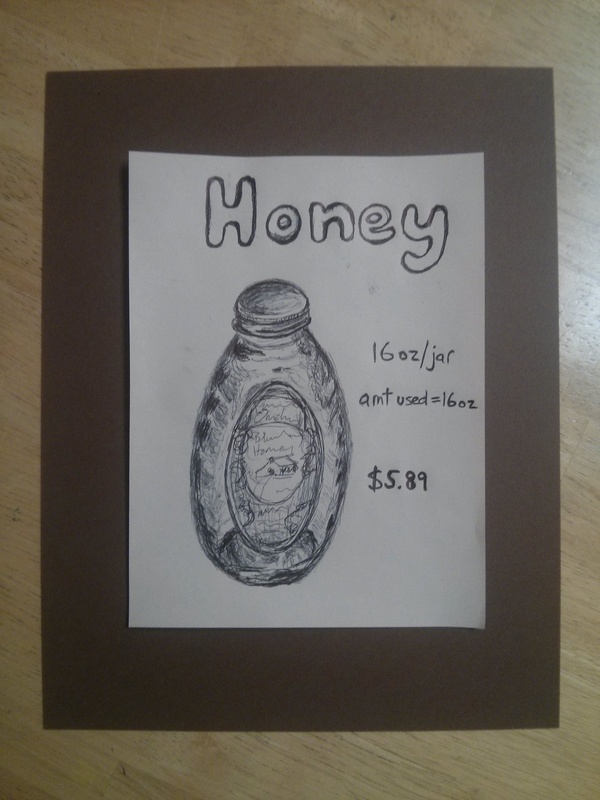 The honey was done, so I was set there. 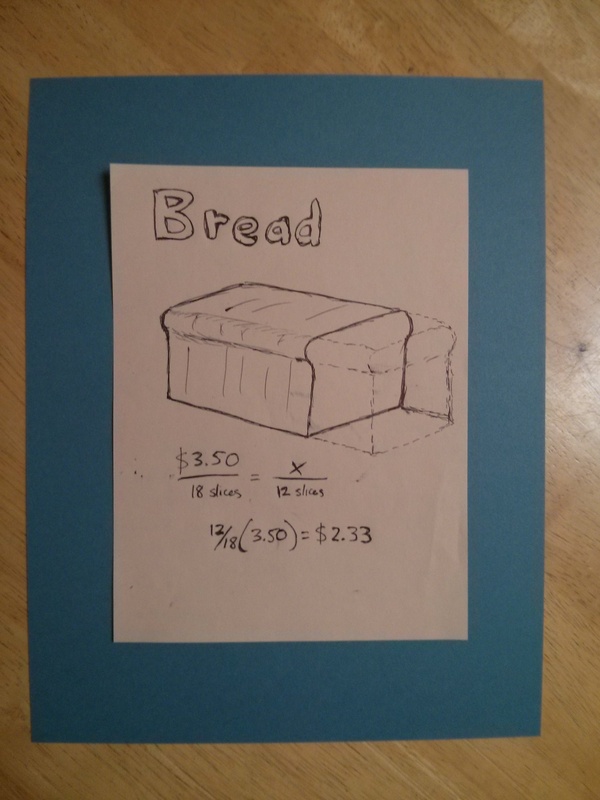 And bread is bread, so I could easily determine the remaining bread value. 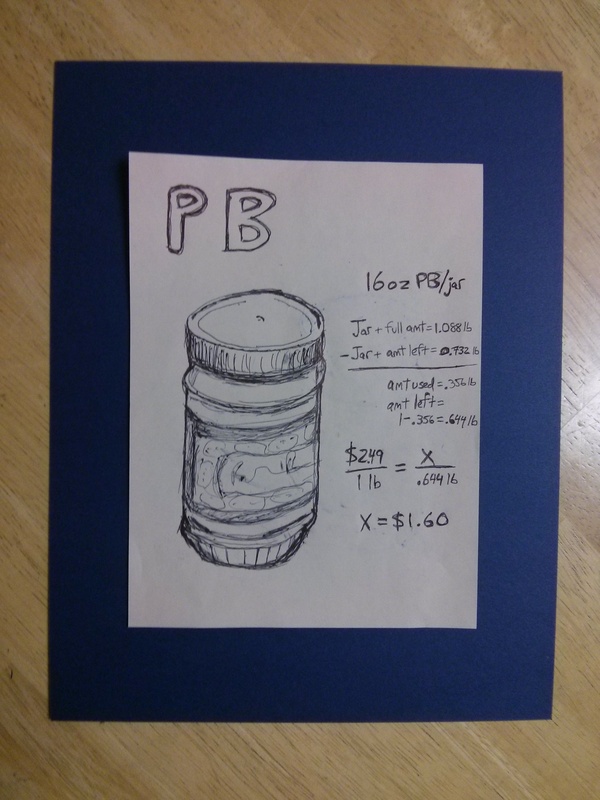 But to make the final adjustments for the remaining jam and peanut butter, I needed to know or at least factor in the tare weights of the jars. Not owning a scale myself, I made a special trip to the Whole Earth Center, where they have several scales to weigh the bulk items. 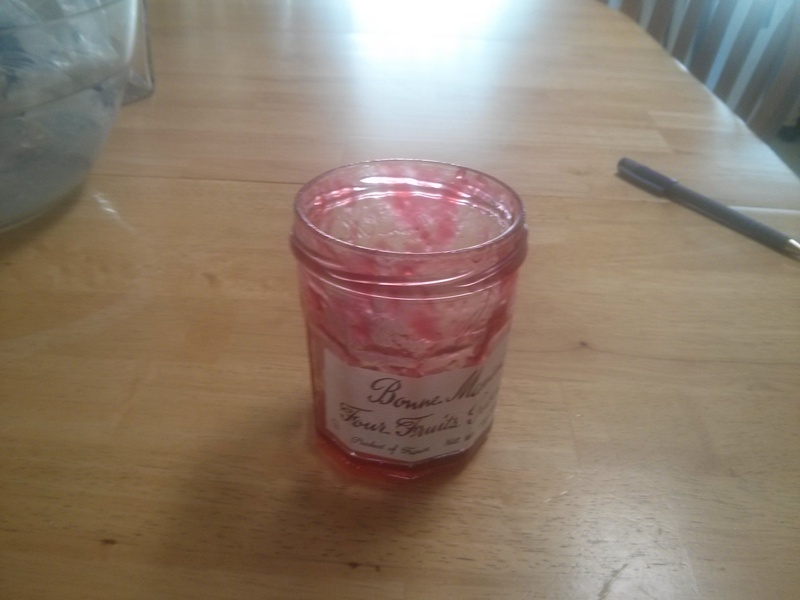 I took my jam and peanut butter measurements – ‘jar + the amount left’ for each one – and then since I hadn’t weighed them ahead of time at the beginning, I brought with me unopened jars of the same jam and peanut butter and weighed those jars too. Then you subtract the partially-used jar number from the full jar number, and the tare is gone and you’re on your way. If this sounds like a lot of words and you think seeing it more graphically would help, with the actual numbers, I agree. In part with this in mind, and in part because, well, I like to draw and I hadn’t done much drawing in a while, I made some art math. If it helps to get a sense of the progression of style, I’ll note too that the pictures appear below in the order in which they were created. Between the spreadsheet and the art math, I feel like there’s a lot to work with here. Math teachers, number lovers, and food and life blog readers of the world, there you are – enjoy and feel free to use as you see fit, responsibly and with attribution. This entry was posted in Uncategorized and tagged art, breakfast, cost, food, honey, jam, life, math, numbers, paul harvey, peanut butter, the secret garden, toast on September 24, 2014 by dave379.